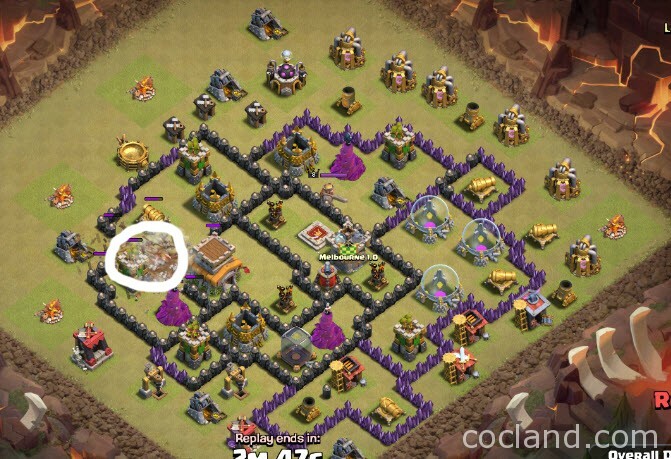 3Go EarthQuake is a nice strategy for you to deal with any Town Hall 8 base which is pretty spread out (not good for Hogs) and can be opened up by Earthquake Spells (It just has 2-3 remaining boxes after the Earthquake). Just go with this strategy If you are at mid-late Town Hall 8. If you are at early-mid TH8, just simply use Dragon attacks for getting all 6 stars in Clan Wars. Many thanks to JTJ for this awesome strategy! You can you Hogs instead of Balloons. When should I use 3Go EQ? 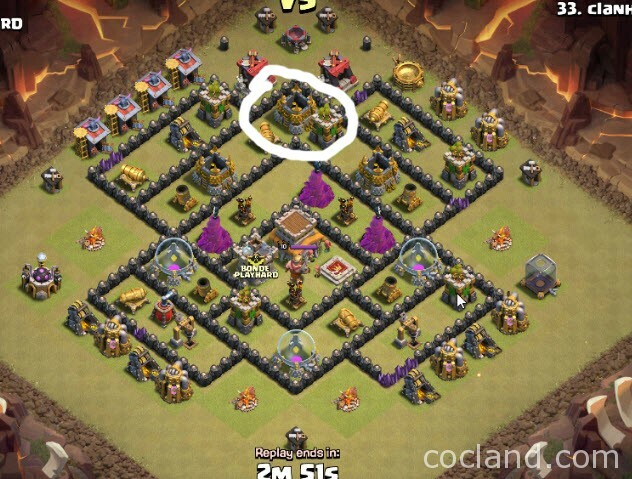 When you are at late TH8 with have Earthquake Spell, level 2 Golems, level 2 P.E.K.KAs and Clan Castle with 25 housing spaces. The enemy base can be opened up by Earthquake Spells easily and just has 2-3 boxes after that. If all Air Defenses are in the middle, you should use Balloons. If all ADs are not in the middle, you can use Hog Riders. Drop 4 Earthquake Spells on attack vector opening up maximum boxes. 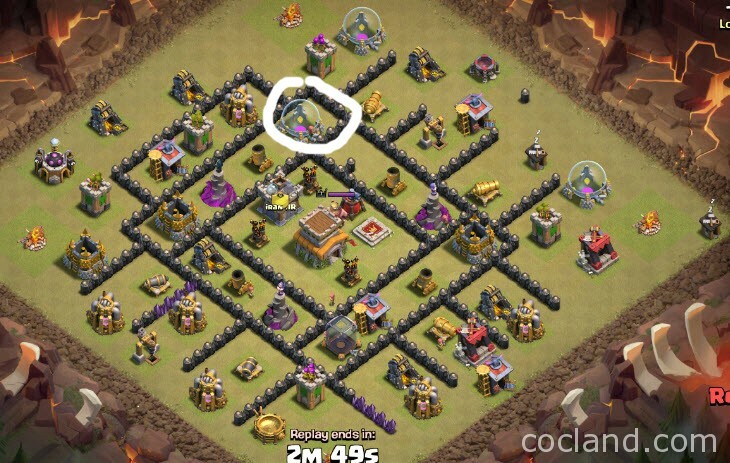 Usually you drop this behind first wall (Wall Breakers that off main attack). Note, if you need to drop Golem/Wizard teams on flanks before EQ to get cuts down (so main army flows to mid) before EQ delay EQ and do cuts then EQ after the next step. 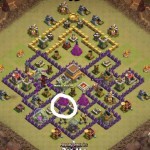 Use either 1 Hog Raider or 1 Balloon to lure the Clan troops out. 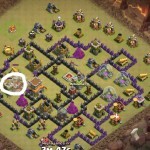 If you know that they are all tier 1 troops, just skip this step and drop the Poison Spells on them later. 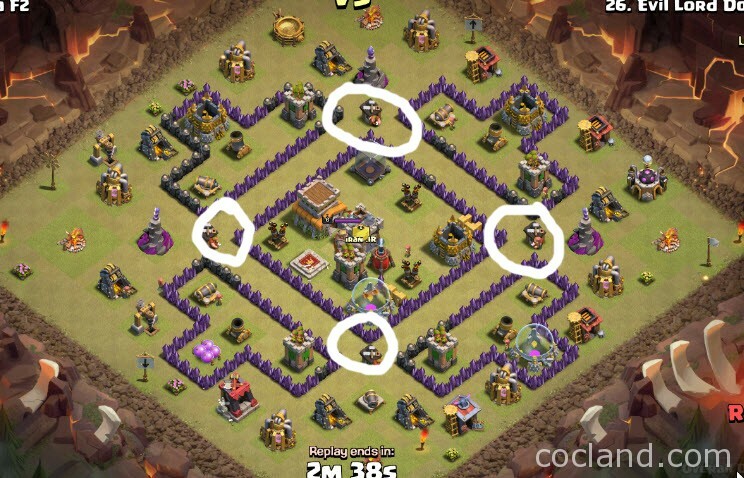 Place your Clan Castle (2 Witches + 1 Barbarian). 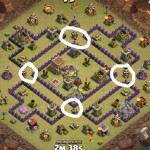 The enemy Clan troops will focus on your Skeletons immediately. 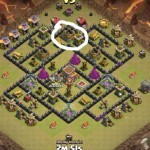 Always make sure that you place the Clan Castle a bit far from the defenses. 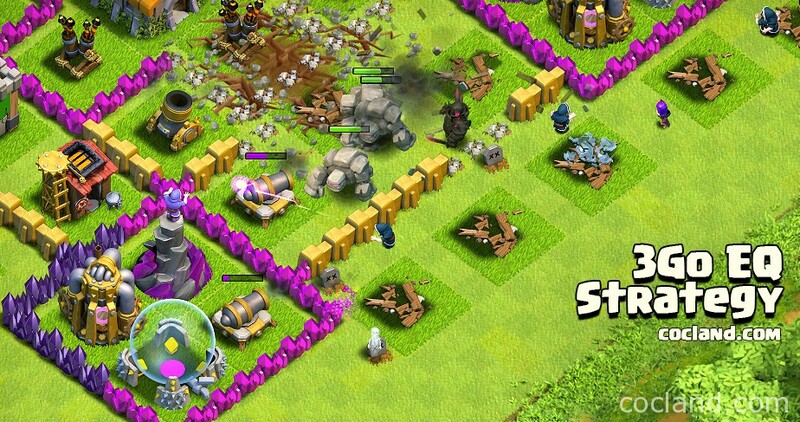 Once the enemy troops are clustered by your Skeletons, place your Golems. Drop 3-4 Wizards when the enemy troops are locked on your Golems. They will be taken down easily. Drop the Poison Spell If they are flying units. After taking down the enemies, deploy your P.E.K.K.A and the 6-7 Wizards. Drop the Poison Spell on the enemy Skeletons If you still have it. 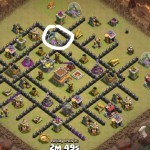 Drop the Healing Spell in the middle to keep your main troops alive, you need them alive to reach the backside. As core team is clearing mid the buildings on outside parallel to them will be uncovered usually. Drop 1-2 wizards on each flank outside to start clearing. If needed use snipe units as blockers for them if there is a stray defense out there. If base has AD in/near mid such that core team takes out when in mid, use Baloons (3-4) to snipe backside defenses once AD overwatch is gone. If Air Defenses are spread such that mid team won’t get all down consider Hog Riders action for snipe (3-4) . Deploy your Cleanup troops for speeding up the raid speed. Pretty simple right? Take a look at the video below from JTJ, the author of this strategy, for more details and you can see how easy it is! 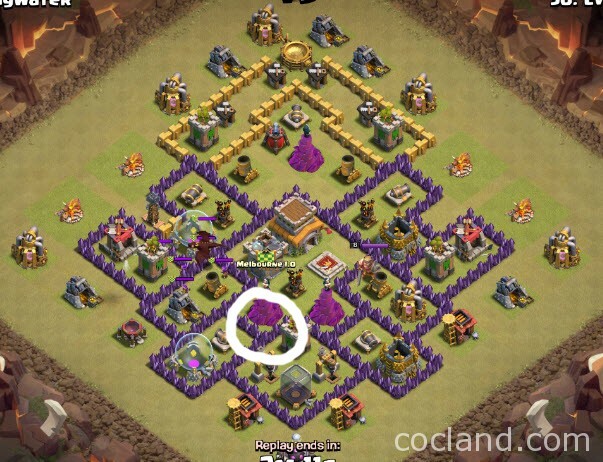 Hopefully you can bring a lot of more stars for your Clans with this strategy!